1. Start with brushing your hair. Your aim should be making it absolutely free from tangles or knots as this will make rest of the things much easier. Once you feel that the hair has become smooth enough, go to the next step. 2. Divide your hair into sections. Use the regular comb as well as the rat tail comb and separate a ‘V’-shaped section right from the top. While sectioning the bangs and rest of the locks out, make sure that you Create the ‘V’ in a proper manner. The top of this section should take the maximum portion of the front hairline in and the bottom should lie at the backside of the crown. 3. Now, clip up the top bangs and focus on backcombing rest of the hair. It is a vital step as you need to add texture to your hair in this way. Hence, do it as much as possible so that it becomes easy for your hair to grip something. 4. Take all your backcombed hair in one hand and sweep it over to either side at the back of your head. Meanwhile, smooth out the top section by using the hair brush or simply your fingers. However, do not let the backcombed hair loose. 5. Now, start inserting bobby pins a little off-center in order to keep the hair at its place. You should start from the bottom or the nape of the neck and go up to the crown gradually creating a vertical row of pins. It is always recommended that you insert the pins in a crisscross manner. 6. After that, create a nice vertical twist by bending the backcombed hair as required. This time also you need to start right from the nape of your neck and slowly go upwards. 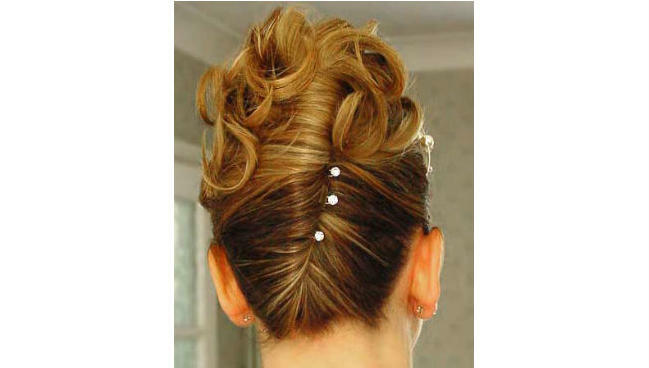 The center of a perfect French twist will hide the row of bobby pin completely. 7. Take the rat tail comb and push the stray hair strands into the twist by using its end. Also, brush the outer layer of hair in order to smooth it out and give the entire twist a polished look. Once you are done with it, push the ‘U’-shaped hair pins into it in a horizontal manner. It will help retain the shape of the twist intact. 8. Now, it is time to add the top ‘V’ section of hair to this twist. Sweep the bangs off to any one side of your head and simply tuck them right at the back the ear. Finally, use lots of hairspray to finish your classy look.